Overview – How Can Total Detox Jazz Drink Help You? Total Detox Jazz Drink may slightly increase your chances of passing the urine drug test. Total Detox Jazz Drink is one the “O” cleansing drinks for passing a urine drug test on the market. The Seller of the product started its promotion in 2001. Like most of the other “detox” cleansing drinks, Total Detox Jazz is designed to detoxify the body and restore body nutrient levels to normal for up to 1 to 5 hours (known as the “detoxification zone”) with the most effect in 3 hours. 2. Normal levels of background nutrients are replenished. As a result, your urine possesses the “markers” that drug tests look for to see if you are trying to beat the test. The Seller, states that “Total Detox Jazz is not a “masking agent.” It does not “hide” toxins. It works with your body to eliminate toxins naturally. Total Detox Jazz is not a herbal flush. It contains only laboratory grade compounds to enhance metacellular respiration and promote toxin and waste elimination from every major body system, including urine, blood, sweat, tears, saliva, liver, digestive, and lymph. In summary: the main principals behind this program are dilution of the urine and addition of necessary vitamins and minerals. The goal is to beat the drug test, not to completely detoxify the body. Since, time of detoxing is only 30 minutes, the product is highly unlikely to provide any significant body detoxification. Time of detoxing is 30 minutes. • 10 oz bottle Total Detox Jazz Drink orange, mango, green apple, wild cherry, kiwi strawberry, blue raspberry and wild cherry flavor, fortified with B-complex and creatine. You must STOP using marijuana a minimum 48 hours before using Total Detox Jazz drink,. The longer you refrain from using marijuana, the easier it is to mask the toxin in your urine. Every hour you lay off marijuana, the body lowers the THC level. • On the day of the drug test, begin your cleansing program with Total Detox Jazz drink. • Shake the Total Detox Jazz Liquid bottle well and drink its entire contents. • Refill the Total Detox Jazz Liquid bottle with water – shake the bottle well and drink. • Urinate at least 3 times within in the following 30 minutes. • If you use 2 bottles of Total Detox Jazz, just follow the instructions on just one of them. Drink more liquid if you have to. This may take 60-90 minutes or more. If you want to be sure of your drug test results, be sure to take your home urine drug test before your actual test. • Consume up to 1 gallon of water every day starting 3 days before drinking Total Detox Jazz on the drug test day. Water is a catalyst that assists the body’s natural cleansing process. • Avoid drinking acidic juices from 24 to 72 hours before using Total Detox Jazz . • Avoid drinking alcoholic beverages, taking over-the-counter drugs, or taking unnecessary medications. • Eat light meals, including fruits, vegetables, and fiber. 1. Total Detox Jazz may be helpful if you are a light to moderate user of marijuana and abstain from the weed 7 to 9 days before the test. This is because the drink contains many vitamins and supplements that increase body metabolism and helps clean the body of THC and reestablishes the body nutrient levels to normal during the “detoxification zone”. 2. Total Detox Jazz is likely more effective than the most popular home remedies. 3. The cost of Total Detox Jazz is significantly less than the cost of other detox drinks and most home remedies. 1. Results vary from person to person. Factors that play a significant role include body weight, life style, individual metabolism and how often and how much marijuana is consumed. 2. Unlikely works for the heavy user. 3. If you weigh over 230 pounds, you will need to consume 2 bottles. If you use 2 bottles of Total Detox Jazz, just follow the instructions on 1of them. 4. No ‘money back guarantee’ from the reseller. 5. You must follow the instructions explicitly if you want to increase your chances of passing your test. A small mistake may ruin your chances of masking your urine and passing the test. 6. You must be on a strict diet on the day of your test. Customer support for Total Detox Jazz drink is provided by www.Amazon.com products via e-mail, chart t and phone line. We did not find many positive reviews or positive feedback on the numerous blogs, various blog, website and online store reviews. We are of the opinion that the Total Detox Jazz is more effective, and cheaper, than the most popular home remedies as it already contains many vitamins and supplements that increase the body metabolism and helps clean the body of THC. In addition, it helps reestablish body nutrient levels to normal during the “detoxification zone”. If you are on a tight budget, you might consider using Total Detox Jazz drink in order to increase your chances of passing your urine drug test. You might get lucky if you have a light to moderate toxic exposure. Have you tried Total Detox Jazz ? If so, let us know what you think! Followed the steps two days in a row;Failed like I didn’t even try;Do Not Trust this product, Try anything else! Eddie..Sorry about your experience with this product. You might read more details about other more effective products on the market here. Will Jazz Detox work with a saliva drug test? 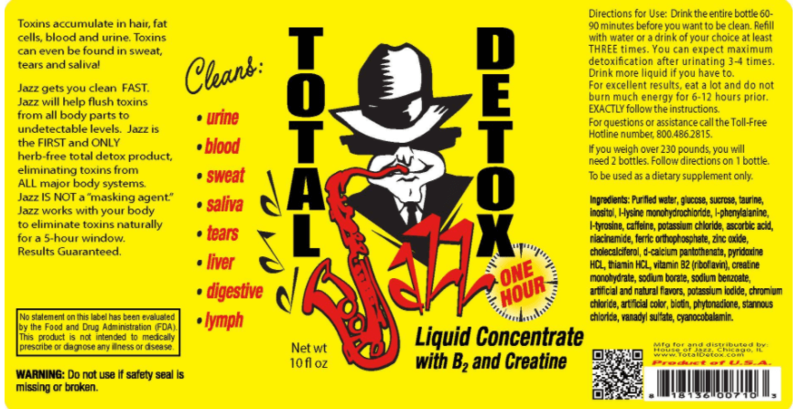 Cb..Total Detox Jazz Drink is not effective for a saliva drug test. In order to increase your odds of passing the saliva drug test you need to abstain from marijuana for 24-48 hours and brush your teeth and gums properly. Does jazz work for suboxone? Jennifer..So far, I have not had any positive feedback regarding the effectiveness of Total Detox Jazz Drink for suboxone. However, since the main principle behind these kinds of “detox drinks is to delute urine and add necessary vitamins and minerals, it should help to drop all substances levels to some degree. I smoked weed like a week ago (i only hit the pipe two times) and I smoked a wax pen about 2 weeks ago. Before that I was clean since the beginning of 2018. I need to drug test (urine) within a week or two. Will it 100% clean out my system?and after I finish drinking the detox and the refill of water, what next? I need specific answers please. Jazmin..I think you should have already become clean by now or you are very close to being clean. I would recommend checking your THC levels with a home urine drug test tomorrow. With your THC exposure, you might test positive for THC up to 4-7 days since your last use. 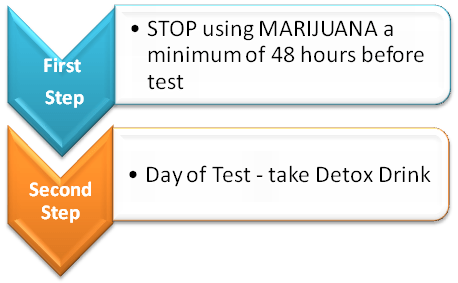 If you keep abstaining from using marijuana, you shouldn’t have any problems with passing your urine drug test without using any detox drinks in one week. I tried jazz detox, read the bottle front to back, top to bottom, and followed the directions step by step. I went to take the test only a couple days later I find out I failed….NO where on the bottle does it say to stop smoking ahead of time. Idk if it works or not if u do stop smoking 2 days before since that was not mentioned. I’ve NEVER had to take a drug test before so I didn’t know anything about”detoxing”. Personally I think marijuana is the DUMBEST drug to test for! It should be legal EVERYWHERE!! It’s less dangerous than alcohol that’s for damn sure!! Anyway it’s neither here nor there, but my question is how “guaranteed” is it if they didn’t add that VERY important FIRST step!!! I bought 2 bottles so I’m out $20+ and a good job….do I get compensated for that?? Doubt it!! To all the smokers you’re pretty much rolling the dice taking ANY drug test if u still recently smoke…. GOOD LUCK!! William..Without knowing your Bio, life style and smoking history during last 3 months, it is tough to predict how effective Total Detox Jazz drink would be in your case. I would say if you were a light/moderate user, don’t carry extra weight, exercise a lot and have a fast metabolism; this product might be effective enough to drop your THC levels below cutoff levels. In any other instances, your odds of passing your urine drug test would be 20/80. Bryan..If you did not smoke marijuana much during April and May, you might test positive for THC up to 4-8 days since your last use. So, I think you have a good chance to detox very soon. I would recommend checking your THC levels with a home urine drug test tomorrow. This will show where you stand and what you should do next. Regarding the Total Detox Jazz drink, it is only effective for 5 hours after consumption. So, usually users try to take it on their drug test day if they still test positive for THC. I don’t think this will be your case though as you might detox from THC pretty soon. I smoked cocaine on Tuesday it’s Thursday I just did the detox. I only hit it 3 or 4 times and was clean for a month prior. Should I be good? Renee..You can test positive for cocaine up to 3-4 days since your last use. Using a home urine drug test will show where you stand now. I didnt smoke for the last 4 months i smoked 2 blunts i am skinny and i drug test friday will i pass?? Savage..There is a chance you might still test positive for THC this Friday. I would recommend checking with a home urine drug test where you stand on the night of your drug test. If you still positive, on your drug test day you might consider using a detox drink like XXTRA Clean. Don’t forget using a home urine drug test in one hour after taking XXTRA Clean. This will show if you can pass it or not. Good luck with your test this Friday. It worked for me(pd urinalysis) and I smoked the day of test. I only had an hr window before my test was done. I only tested positive for high levels of creatine They thought something was wrong w my liver. Which resulted in additional testing but still no marijuana. Officer Pothead..Thanks for your feedback. Congratulations with your test results. I tested positive for marijuana on a at home urine drug test yesterday the 24th. I smoked last the 15th and it is now the 25th and before that I hadnt smoked in months. Will I pass my drug test today if I take this drink? Diz..Your odds of passing your urine drug test would be greater if you used a detox drink like XXTRA or Mega Clean. But even with Total Detox Jazz Drink you have a better chance to pass than just drinking water. By using a home urine drug test in one hour after taking Jazz Drink you will know if you can pass it or not. I am 51 years old and never took a drug test before until this week. I am a marijuana smoker and was concerned about taking the test. It was for a new job I was applying for. My cousin told me about Jazz detox and even bought me a bottle at 12.99. I followed directions as labeled and I passed my very first drug test. Thank you for this product! I never smoke while working or has smoking ever affected my job performance. I do not do any other drugs . I was tested by labcorp just so you all know. I was concerned about my pee being almost clear at testing. I attribute that to all the water I drank. But I passed.. Thank you Jazz! Wencro.. Congrats with your tests results! I am glad that this product was effective enough in your case. I am a generally moderate smoker of marijuana, but stopped smoking as of Tuesday for a drug test I have on Monday. I drank a detox drink yesterday, and am planning to drink another detox drink tomorrow. I am going to take the Jazz Pre-Cleanse and the Detox pills on Monday morning, about 1 hour before my drug test. Will my urine be too diluted by doing multiple detoxes? Should I avoid the 2nd detox drink to avoid being to diluted? I took a home drug test an hour ago, and am still positive with THC in my system. Any suggestions? I am desperate. Rebecca..Detox drinks like Total Detox Jazz drink are only effective for 5 hours. So, taking a detox drink yesterday wont’ increase your chances of passing your urine test. In order to increase your odds of passing the urine test, on your drug test day you might consider drinking another detox drink. 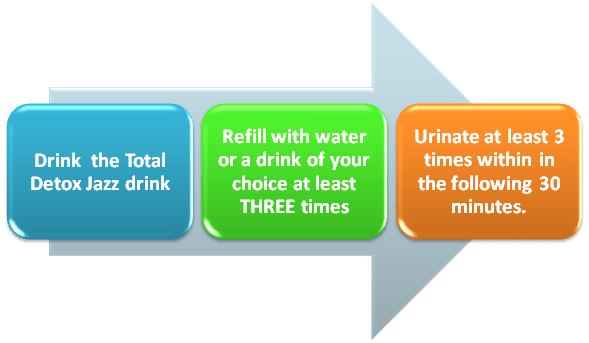 By using a home urine drug test in 1 hour after taking the detox drink will help you to find if you can pass it or not. We have seen that some users try using synthetic urine as their back up plan, if the urine drug test is unsupervised. Hope this answers your questions and good luck with your test tomorrow. I was a light daily smoker for 6 months. It’s been 22 days since I stopped. Still failing at home tests. I have a DOT physical in 5 days. What’s your best solution? I purchased a Jazz drink for the day of the test. I also started drinking a gallon of water yesterday. Any feedback is is appreciated. I recently picked up smoking again rather than drinking. I smoke using pipe and last smoked last night. I have a drug test in four hours from now. When should I drink Jazz? I’m also taking prescribed water pills…with these help or interfere? Jess..Most detox drinks including Total Jazz Detox drink should be taken on your drug test day. Such detox drinks are effective for 5 hours with the most effect being the 3rd hour. Using a home urine drug test in one hour after taking Total Jazz Detox drink will show where you stand and what you should do next. Wesley on Fact or Fiction – You Can Beat a Drug Test with Home Remedies? Erick on Vaping vs Smoking Marijuana – How This Can Affect Your Drug Test?